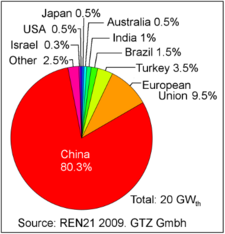 China is the world's largest market for both photovoltaics and solar thermal energy. Since 2013 China has been the world's leading installer of solar photovoltaics (PV). In 2015, China became the world's largest producer of photovoltaic power, narrowly surpassing Germany. In 2017 China was the first country to pass 100 GW of cumulative installed PV capacity, and by the end of 2018, it had 174 GW of cumulative installed solar capacity. As of May 2018, China holds the record for largest operational solar project in its 1,547-MW project at Tengger. The contribution to the total electric energy production remains modest as the average capacity factor of solar power plants is relatively low at 17% on average. Of the 6,412 TWh electricity produced in China in 2017, 118.2 TWh was generated by solar power, equivalent to 1.84% of total electricity production. The goal for 2050 is to reach 1,300 GW of solar capacity. If this goal is to be reached it would be the source with the largest installed capacity in China. Solar water heating is also extensively implemented, with a total installed capacity of 290 GWth at the end of 2014, representing about 70% of world's total installed solar thermal capacity. According to plans unveiled by the National Development and Reform Commission in 2007, China's installed solar capacity was to grow to 1,800 MW by 2020. However already in 2009, Wang Zhongying, a Commission official, mentioned at a solar energy conference in Shanghai that the plan might be exceeded several-fold, with the installed capacity possibly reaching as much as 10 GW by 2020. In 2010 a new feed-in tariff was introduced. Projects completed before September 30, 2012 received 1.15 yuan ($0.18) per kWh. Since then, solar power deployment vastly exceeded initial government plans. The 200 MW Huanghe Hydropower Golmud Solar Park was completed in 2011, the world's largest solar farm at the time. There were many other solar farms in Golmud, totaling 570 MW at the end of 2011, with another 500 MW expected in 2012. The Qinghai province, which contains Golmud, was leading China in solar installations. The Chinese PV production system faced severe external shocks since 2010. A sharp recession in the global demand due to institutional alterations in the German market in 2010, followed by anti-dumping duties and anti-subsidy countervailing duties on Chinese PV products enforced in both USA and EU. Chinese PV manufacturers, who were already running on their full capacity, faced difficult situation in 2011 and 2012 with huge financial loses that even led to bankruptcy of some important actors, such as SunTech Power in 2013 being defaulted on $541 million of convertible bonds. To rescue the huge PV industry with its large labor market and assets, a comprehensive set of policies were introduced by the Chinese government mainly to stimulate the domestic market. Accordingly, the annual installed capacity in China has experienced a notable growth since 2011. This growth was mainly due to the construction of several PV power plants around the country. In May 2014, the National Development and Reform Commission announced that the solar capacity target had been upped again, now to 70 GW by 2017. In October 2014 China planned to install 100 GW of solar power—along with 200 GW of wind, 350 GW of hydro and 58 GW of nuclear power by 2020. Market research firm NPD Group forecasted that China will have over 100 GW of PV capacity by 2018. In October 2015, China's National Energy Administration (NEA) set an ambitious 23.1 GW target for 2015, upgrading its previous target of 17.8 GW from March 2015, which was already more than the entire global PV capacity installed in 2010. At that time, China planned to install 150 GW of solar power by 2020, an increase of 50 GW compared to the 2020-target announced in October 2014. The goal set by the Chinese authorities of 105 GW solar capacity for the year 2020 was passed in July 2017. China installed 43 GW of solar power in the first nine months of 2017, already above the 34.5 GW for all of the year. This has caused the Chinese Government to more than double the original quota to 213 GW for the 2020. CCB International Securities Ltd. raised its forecast for China’s solar power capacity to 55 gigawatts from 40 gigawatts for 2018. Of the 6,412 TWh electricity produced in China in 2017, 118.2 TWh was generated by solar power, equivalent to 1.84% of total electricity production. Global Horizontal Irradiation in China. A large part of the solar power capacity installed in China is in form of large PV power plants in the west part of the country, much less populated than the eastern part but with better solar resources and available land. China has been the world's largest manufacturer of solar panels since 2008 and, since 2011, has produced the majority of global photovoltaics on an annualized basis. Industry projections estimated that, by the end of 2017, China would have enough manufacturing capacity to produce 51 GW of PV modules per year, an amount over twice as large as 2010's global production of 24 GW. The industry is dominated by several major manufacturers. They include CHINT Group Corporation, JA Solar Holdings, Jinniu Energy, Suntech Power, Yingli, China Sunergy and Hanwha SolarOne. Large debt challenges several manufacturers. China has large potential for concentrated solar power (CSP), especially in the south-western part of the country. The highest daily mean values of direct normal radiation are found in the Qinghai-Tibet Plateau and Sichuan Basin, at 9 kWh/m2. Most of northern and western China has daily average direct normal radiation over 5 kWh/m2, considered the limit for economical use of CSP. Practical limitations for deployment of CSP include mountainous terrain and distance from energy load centers, mostly concentrated in the east. The 12th five-year plan, for 2011 to 2015, called for the installation of 1,000 MW by 2015, and 3,000 MW of CSP plants by 2020. However, at the end of 2014, only 14 MW of CSP were operational in the country. 1,000 MW in Qinghai by Lion International Investment Ltd.
China is the first country for solar water heating capacity in the world, with 290 GWth in operation at the end of 2014, accounting for about 70% of the total world capacity. In terms of capacity per unit of population, China comes 7th in the world with 213 kWth per 1,000 people. Most of the installed capacity (92%) was evacuated tube water heaters. China is a large producer of polysilicon, for use in first generation solar cells around the world. A byproduct of the process is poisonous silicon tetrachloride, which is normally processed and recycled at a higher cost in the developed world, but often dumped by Chinese green startups, With proper recycling the polysilicon would cost $84,500 per tonne, but the Chinese companies are making it at $21,000 to $56,000 a ton. Zhejiang Jinko Solar Co., Ltd., founded in 2006 as a subsidiary of Hong Kong-invested JinkoSolar Holding Co, Ltd (NYSE Stock Code: JKS), produces solar panel photovoltaic cells and wafers. It employs more than 10,000 professionals in two factories in east China and has offshore offices and warehouse in the United States and Europe, according to the company website (www.jinkosolar.com). On Thursday, 15 September 2011, more than 500 people from Hongxiao Village protested over the large-scale death of fish in a nearby river. Angry protesters stormed the factory compound, overturned eight company vehicles, and destroyed the offices before police came to disperse the crowd. Protests continued on the two following nights with reports of scuffle, officials said. Chen Hongming, a deputy head of Haining's environmental protection bureau, said the factory's waste disposal had failed the pollution tests since April. The environmental watchdog has warned the factory but it had not effectively controlled the pollution, Chen added. The Chinese government subsidies for solar energy (PV) have been described as "unsustainable" (although reduced in 2017) and are sometimes paid late to generating companies. Much of the solar power generating capacity has been built in the relatively less populated west of China whereas the major electricity consumption areas (such as Shanghai and Beijing) are in the east causing difficulties and expense in transferring the energy between regions with curtailment rates of 30% or more reported in 2017. ^ Rose, Adam. "China's solar capacity overtakes Germany in 2015, industry data show". ^ "China Overtakes Germany To Become World's Leading Solar PV Country". cleantechnica.com. ^ "China Installed 18.6 GW Of Solar PV In 2015, But Was All Of It Connected? - CleanTechnica". cleantechnica.com. ^ "China Is Adding Solar Power at a Record Pace". Bloomberg.com. 19 July 2017. Retrieved 1 August 2017. ^ a b c Shubbak, Mahmood H. (May 2019). "The technological system of production and innovation: The case of photovoltaic technology in China". Research Policy. 48 (4): 993–1015. doi:10.1016/j.respol.2018.10.003. ^ "China Installs 44.3 Gigawatts Of Solar In 2018". CleanTechnica. 2019-01-23. Retrieved 2019-02-18. ^ "IEEFA Report: Advances in Solar Energy Accelerate Global Shift in Electricity Generation - Institute for Energy Economics & Financial Analysis". Institute for Energy Economics & Financial Analysis. 2018-05-21. Retrieved 2018-05-22. ^ "Report" (PDF). www.ren21.net. 2016. ^ a b c "2017 electricity & other energy statistics - China Energy Portal - 中国能源门户". 6 February 2018. ^ Yang, X. Jin; Hu, Hanjun; Tan, Tianwei; Li, Jinying (2016). "China's renewable energy goals by 2050". Environmental Development. 20: 83–90. doi:10.1016/j.envdev.2016.10.001. ^ "China's Big Push for Renewable Energy". ^ a b "Solar Heat Worldwide 2014" (PDF). www.iea-shc.org. IEA Solar Heating & Cooling Programme. Retrieved 13 June 2016. ^ a b "China solar set to be 5 times 2020 target". Reuters. May 5, 2009. ^ "Sun shines on development of power sector-Industries-chinadaily.com.cn". usa.chinadaily.com.cn. ^ "China Daily USA". www.chinadaily.com.cn. 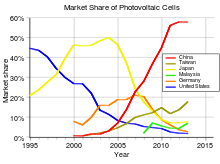 ^ "Global Market Outlook for Photovoltaics until 2015". European Photovoltaic Industry Association (EPIA). May 2011. p. 39. Archived from the original on 2010-07-31. Retrieved 10 March 2012. ^ "Publications - European Photovoltaic Industry Association". 3 December 2012. Archived from the original on 2012-12-03. ^ "China Targets 70 Gigawatts of Solar Power to Cut Coal Reliance". Bloomberg News. May 16, 2014. Retrieved 16 May 2014. ^ Michael Barker (2014-08-29). "China on Track to Have Over 100 GW of PV Capacity Installed in 2018". NPD SolarBuzz. Retrieved 2014-09-08. ^ Militsa Mancheva (9 October 2015). "China again lifts 2015 solar target, now aims at 23.1 GW". Seenew Renewables. ^ "China's PV power capacity to hit 150 gigawatts by 2020". Xinhuanet.com. 13 October 2015. ^ "China has already surpassed its 2020 solar target". 2017-08-24. ^ "China on Pace for Record Solar-Power Installations". Bloomberg.com. 2017-11-20. Retrieved 2017-12-24. ^ "Global Solar Atlas". Retrieved 7 December 2018. ^ "National Survey Report of PV Power Applications in China 2011". ^ "Snapshot of Global PV 1992-2014" (PDF). International Energy Agency — Photovoltaic Power Systems Programme. 30 March 2015. Archived from the original on 30 March 2015. ^ "2015年光伏发电相关统计数据---国家能源局". www.nea.gov.cn. Retrieved 2016-02-08. ^ "2016 detailed electricity statistics (Original title:2016年全国电力工业统计快报数据一览表)". Retrieved 2017-01-20. ^ "2017 electric power industry summary statistics (Original title: 2017年全国电力工业统计数据)". Retrieved 2018-01-24. ^ "能源局：2016年光伏发电累计装机容量7742万千瓦 - 中国能源网". www.cnenergy.org. ^ "2018 Q1&2 PV installations utility and distributed by province; Original Title: 2018年上半年光伏建设运行情况". National Energy Administration, translation via chinaenergyportal.org. Retrieved 3 March 2019. ^ "2018 PV installations utility and distributed by province; Original Title: 2018年年光伏建设运行情况". National Energy Administration, translation via chinaenergyportal.org. Retrieved 22 March 2019. ^ "Annual Solar Photovoltaics Production by Country, 1995-2012". Earth Policy Institute. 2013-07-31. Retrieved 2014-08-08. ^ "Annual Solar Photovoltaics Module Production in China, 2007-2013, with Projection to 2017". Earth Policy Institute. 2014-07-08. Retrieved 2014-08-08. ^ "World Solar Photovoltaics Production, 1975-2012". Earth Policy Institute. 2013-07-31. Retrieved 2014-08-08. ^ "Solar Energy Booming in China". ^ a b c d Wang, Jun; Yang, Song; Jiang, Chuan; Zhang, Yaoming; Lund, Peter D. (April 2017). "Status and future strategies for Concentrating Solar Power in China". Energy Science & Engineering. 5 (2): 100–109. doi:10.1002/ese3.154. ^ a b "China to Have 3 GW of Concentrated Solar Thermal Power (CSP) by 2020 - CleanTechnica". cleantechnica.com. ^ a b Washington Post. Solar Energy Firms Leave Waste Behind in China. March 9, 2008. ^ "Protest over factory pollution in E China enters third day". China Daily. Xinhua. 18 September 2011. Retrieved 19 September 2011. Hangzhou - Hundreds of villagers in East China's Zhejiang Province protested for the third day on Saturday at a solar panel manufacturer, whose parent is a New York-listed firm, over concerns of its harmful wastes. ^ a b Baraniuk, Chris (2017-06-22). "Future Energy: China leads world in solar power production". BBC News. Retrieved 2017-06-27. 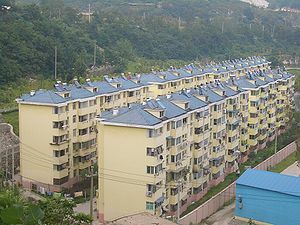 Wikimedia Commons has media related to Solar power in China. This page was last edited on 24 April 2019, at 08:03 (UTC).